Baldi's Basics in Education and Learning is not a pleasant game to play -- it's a great game, but it's one that never really makes you feel good. First it starts off as a janky-but-charming educational adventure but it rapidly descends into horror-madness. Unsurprisingly, this blend of genres has become one of the biggest games of 2018. I got the opportunity to talk to the game's dev Micah, and ask about what it was like building a nightmare. 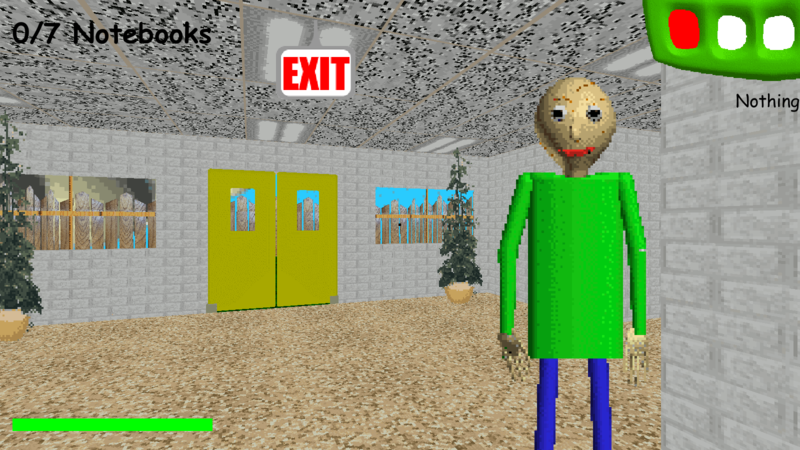 First things first: Who are you and what is Baldi’s Basics in Education and Learning? I’m Micah McGonigal, probably better known as mystman12. I love making games, and really hope I can make them for a living! Baldi’s Basics in Education and Learning is a game I made in two weeks for the 2018 Meta Game Jam. It’s an edutainment parody game with a weird sense of humor! It starts out seemingly normal, but after a certain point in the game it does a 180 and that’s when the real game begins. Baldi, the titular character, will begin chasing you while you explore and collect notebooks. You have to watch out for other characters as well, who usually hinder you, but can also be helpful in certain situations. There are also items that can be used to aid you on your quest to escape the school! What made you want to develop [SPOILER ALERT] a horror game wrapped in an educational aesthetic? Were you inspired by any of the other post-modern games that have enjoyed success recently? The main inspiration for the game is an old edutainment game called Sonic’s Schoolhouse. My first thoughts when I first discovered that game were basically about how terrifying it was! It was clearly supposed to be kid-friendly and inviting, but there were so many things off about it that just made it unnerving. A mishmash of art styles, Sonic’s weird voice, the white brick walls (Those have always creeped me out for some reason! :P ), Dr. Eggman silently pursuing the player… I could go on and on! All these things combined made it so creepy, and I guess that’s when I realized an edutainment themed horror game might actually work. I’ve actually had the idea for Baldi’s Basics for a few years now, and sadly I don’t remember exactly when I came up with, or what different things might have inspired different elements. I think it’s safe to say though that if there are any recently successful games that have helped shape Baldi’s Basics, Five Nights at Freddy’s would definitely be one. I’ve only played the first and second games, but I think the aspect of there being different characters with different behaviors in FNaF inspired me to do something similar with the other characters in Baldi’s Basics and how they each have unique behaviors as well. I’ve noticed that you’re really into pinball. Is there some relation between Baldi’s Basics and pinball that I’m missing? Why do you love pinball as much as you do? Baldi’s Basics doesn’t really have any relation to pinball, although I do think my time in the hobby has somewhat influenced the way I think about game design overall. The reason I’m so into pinball is because I pretty much love every aspect of good pinball games! I first got hooked when I played Pinball Hall of Fame: The Williams collection, which recreated some classics machines from real life. Some of the games in that collection master the elements in pinball that I enjoy so much: Great playfield design and rulesets, beautiful artwork and light shows, and super exciting sounds and music (Seriously, there is some incredible pinball music!). Not to mention the awesome toys and overall mechanical nature of pinball machines. I’ve always loved mechanical stuff growing up, so seeing the unique ways different pinball machines interact with the pinballs has always been fascinating to me. Then there’s the physical part of it. The fact that you’re dealing with a pinball, that isn’t programmed or anything, means your dealing with real world physics. This can be unpredictable at times, keeping things fresh, but at the same time it’s still more than consistent enough to result in a game that’s all about skill. All those things combined make for something I love going back to again and again! With Baldi’s huge success, there have been several fan games and knockoffs that have come out of the woodwork. How do you feel about these takes on your work? In the case of fan games, for the most part, I think it’s awesome! If someone had told me before the game released that people would be making fan games of Baldi’s Basics, I never would have believed them, haha! I’m really super thankful for and humbled by all the fan support. I’m glad that Baldi’s Basics is inspiring people to create games of their own, and I think it would be super cool if some day someone who started out by making a Baldi’s Basics fan game were to go on to become a game dev. I also think it’s just interesting to see other people’s takes on Baldi’s Basics. I have a pretty clear idea of what kind of game it is and what I want to do with it in the future, so seeing what fans do similarly and differently to my ideas is really cool! The one thing I am kind of wary about is when it comes to protecting my IP, though that’s something fans have also been pretty awesome about because they usually make things clear about their game being a fan game and all that. The issues start when it comes to knockoffs and such (When I say knockoff, I’m referring to the games that try to look official, or close enough to the real thing, and only seem to care about making a quick buck). This issue pretty much only exists on mobile market places, and while it’s pretty annoying, it’s not like it’s something I’m stressing over or anything. I’ve been taking steps against these knockoffs and the issue shouldn’t be so bad in the future. I hope his Kickstarter becomes a success.